Beginning with their first successful breakfast cereal, this American company has been producing delicious and nutritious ready-to-eat breakfast products for over 100 years. The company now produces over 20 well-branded breakfast foods and distributes them to hundreds of countries worldwide. Over their long history the company has seen many changes but their goal is still to transform grains and other materials into good for your family foods. They have long been looking for weighing and batching solutions for the food industry. An Engineer for the breakfast food company had worked with Sterling Systems & Controls in the past and had recommended them for their current need to update their Minor Ingredient Weighing and Batching System for the production of waffles. The waffles were an existing product but changes in raw material availability continually led to evolving new product development. In addition to increasing production flexibility, the company also saw opportunities for increased line efficiency. 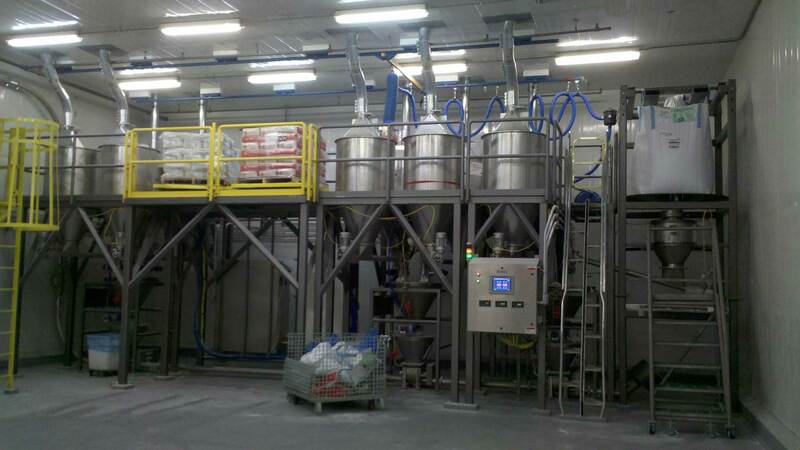 They wanted a system that would continue to maintain the high standards for a quality end product but hoped that the new system could also lessen their batch cycle time and reduce ingredient waste. Doing so would increase their profitability and give them an edge in the very competitive breakfast food market. The batching process is all controlled and monitored. The systems are specifically designed to provide complete batch integrity as well as data collections at each control point. ERP interfaces are standard using a variety of software and hardware platforms. They needed a new weighing and batching solution for the food industry. The Engineering Team of Sterling Systems & Controls, Inc. met with the customer to review their current process. Major consideration was given to the customer’s formula data, batch cycle time, ingredient data, raw material storage, conveying distance and space constraints, to custom-engineer a solution. Inclusive within the Sterling Systems & Controls Minor Ingredient Weighing Systems were several Engineering deliverables. The client was provided with a Process and Instrumentation Diagram, Electrical Drawings, Front Panel Layouts, Mechanical Assembly Drawings, and a Sequence of Operation. Upon approval, Sterling Systems & Controls provided a comprehensive Minor Ingredient System, including 10 stainless steel minor ingredient supply bins and feeder assemblies, three scale hoppers and support frames, a bulk bag weighing system for sugar, a bulk bag unloader for sugar, three minor ingredient transfer hoppers, a Vacuum Transfer to the Mixer System, a Dust Collection System, PLC/Panel View Plus Control System as well as other related components. Sterling Systems prooved capable of delivering weighing and batching solutions for the food industry. It was custom designed and met all requirements. All of the items were included within the scope of supply along with the engineering review of the application to determine the system requirements. The process is controlled by a PanelView Plus/PLC based system. The batching portion consists of ten raw material supply bins and a bulk bag sugar unit. The feeders feed three independent scale hoppers. Once the product is batched, a Vacuum Conveying System is utilized to transfer the batching ingredients to two mixing vessels to complete the process. Now complete, the system is able to produce a batch every fifteen minutes or less to one of two mix vessels. The new system insures batch accuracy and integrity to obtain the customer’s high standards. The fully integrated system has increased line efficiency and profitability through automation. The customer’s other goals of reducing batch cycle time and decreasing waste have also been achieved. The system operates seamlessly and has improved the overall finished product, allowing the customer to maintain a quality standard unmatched in the breakfast food industry. Sterling Systems & Controls has had an ongoing working relationship with this client for the past decade. Sterling Systems & Controls has designed and installed 4 custom engineered systems for the breakfast food company and has become a trusted partner in developing weighing and batching solutions for the food industry to aid in the customer’s continued growth.